for creating places, respecting context, respecting the local vernacular, and creating visual interest in Edison, New Brunswick, and Red Bank. Walk past the large foyer windows of Heritage at Clara Barton in Edison, alongside the façade synthesizing old and new architectural elements at Pellettieri Homes in Trenton, on the curved sidewalks of the intimate, colonial-style development at Hopes Crossing in Toms River, or along the graceful entrance arcade to the Providence Square in New Brunswick: you will certainly be struck by the economy and elegance of each. These are new-looking residential buildings to be sure, several visibly devoted to senior citizens, but beyond an evident and uncommon attention paid to quality and creativity in construction, it is not immediately apparent what these successful endeavors in disparate cities across the state have in common. Winding Ridge, a family-style housing development in Neptune, generates a similar sense of community to these projects, and River Street Commons, a senior residence in Red Bank, shares with them an evident desire to preserve and restore historic architectural detail. Nevertheless, each of these construction projects is practically and aesthetically distinct – simultaneously attuned to the specific needs of its occupants and to its host community. Each offers its residents modern services while preserving a sense of the characteristic history and heritage of the city in which it resides. All are examples of intelligent and functional urban design, all are award-winning, and all have been developed by Pennrose. An established developer and property manager, the Philadelphia-based Pennrose has been devoted to the cause of affordable housing for more than 30 years. While a majority of Pennrose’s work has been done in its home state (and much of that in its home city), the progressive company has made itself a welcome and positive presence in many of New Jersey’s cities as well. As developer, owner and operator of more than 50 unique projects, Pennrose founder and chairman John Rosenthal takes pride in his company’s record and holds a lasting dedication to the cities and communities it seeks to enhance – never has the firm sold a property it has developed. 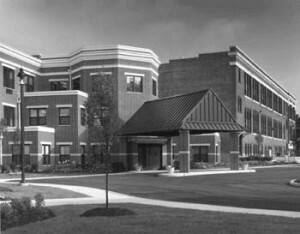 Whether designing residences for senior citizens or family occupancy – or in some cases, assisted-living facilities or rehabilitation houses – Pennrose construction has been characterized by responsibility and sensitivity to the need for community, coupled with an effort to preserve and foreground distinctive architectural features. Many of Pennrose’s developments in the greater Philadelphia area are startling, gorgeous renovations of older structures that had fallen into disrepair. Here, Pennrose’s aesthetic concerns are inseparable from their communitarian ones: seniors and low-income families are granted access to living quarters in buildings with genuine personality and character, and which foster in their occupants an undeniable sense of pride. Perhaps most remarkably, while many “retro” rehabilitation projects are marred by an artificial, plastic sheen, the Pennrose developments look and feel authentic and organic, natural outgrowths of the mortar, spade and brickwork of their surrounding neighborhoods. It is therefore no surprise that Pennrose has shown a protracted commitment to older New Jersey cities, municipalities facing roughly comparable challenges. New Brunswick, Red Bank, Camden, Trenton – all sites of Pennrose interest and investment – are relatively small, long-settled urban areas with aging infrastructures, a considerable percentage of residents over the age of sixty-five, circumscribed municipal boundaries with very little room for expansion, and manifest need for affordable housing. 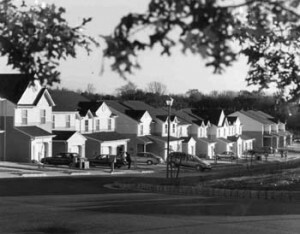 In the mid-1990s, New Brunswick – a city with limited open land – witnessed an increase in its senior population, shadowed by an accompanying spike in property values. With little room for additional building and widespread dissatisfaction among local senior citizens with available housing choices, Pennrose partnered with the municipal government to create Providence Square, a combination new construction/rehabilitation conveniently located close to the downtown district. Offering 99 attractive units, Providence Square immediately improved residential options for New Brunswick seniors, simultaneously keeping them involved in the life of the city while creating a new and self-contained community. In cities like New Brunswick, Pennrose has been resourceful in converting disused institutional structures into residences. Edison’s Clara Barton School, re-imagined as senior housing in 1984, was acquired by Pennrose, renamed Heritage, and redeveloped into an elegant assisted living facility. Similarly, Red Bank’s historic River Street School, which had fallen into disrepair, has achieved new life as the award-winning River Street Commons. Here, the challenge was to preserve the School’s distinctive architectural features – so characteristic of central Red Bank – while creating an environment conducive to senior-living. Pennrose has succeeded marvelously in their objective. Always committed to improving quality of life in these older cities, Pennrose has frequently sought to work with community nonprofit organizations. Pellettieri Homes, a Trenton-based housing nonprofit, partnered with Pennrose to bring a senior facility to the capital city. Confronted by the inevitable fiscal limitations of municipalities most in need of affordable housing, the company has availed itself of creative financing, as they have in Neptune, where the Winding Ridge community was funded in part by low-income tax credits. The scope of Pennrose’s vision ranges from the banks of Lake Erie to Browns Mills in the Pine Barrens to the inner city of Washington, but while each project is unique, the company’s hallmarks become manifest once the observer knows what to look for: outstanding and unusually creative design, modern features, grace, functionality, and a premium on elements that foster a sense of community among residents. Dedication to the creation of low-income housing that commands pride and respect among occupants, Pennrose has helped to raise the spirit of many of New Jersey’s most venerable cities, and, in the process, has afforded a kind of dignity to those who live in these singular and extremely commendable projects.